There have been so many rumours lately regarding the iPhone 5S, when it will or won’t be released, what features it will or won’t have, and I hope you guys are all keeping up with it. In the latest turn of events, conflicting with previous reports WWDC 2013 actually wouldn’t see the release of the iPhone 5S, a leaked report from Japanese telecom company KDDI shows the iPhone 5S is expected to be available for pre-order on June 20th. The document itself is claimed to be a reference guide for the sales floor in cell phone dealers and carrier stores, and looks pretty authentic. 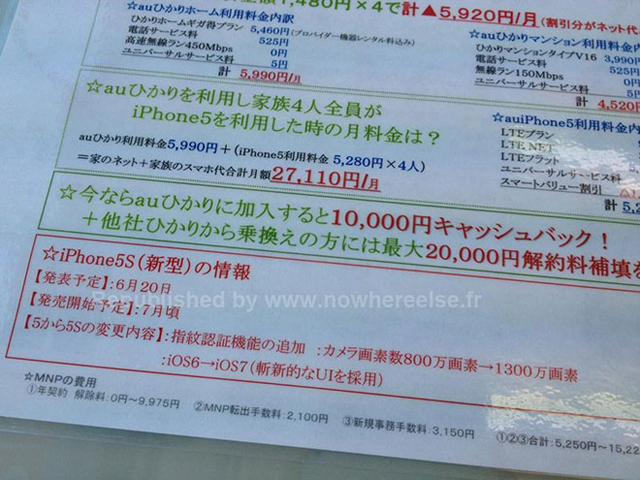 As shown, the iPhone 5S has been highlighted in Red, stating that it has been scheduled for a pre-sale announcement of June 20th, with sales starting in July. Below the release dates is a notation for major features expected in the iPhone 5S, and in this case states it will have a 13-megapixel camera, iOS 7 and a fingerprint reader (not the first time we’ve heard this one). The areas highlighted in green offer the current monthly plans for the iPhone 5, adding evidence that this is in fact an authentic document. While still only speculation, the timings are very close to that of the WWDC 2013 placement, which occurs exactly 1 week before the suspected release of the iPhone 5S. Tim Cook confirmed we will see surprises for the fall quarter during the companies latest earnings call, and we’ve already heard a new MacBook lineup will be the highlight of the WWDC conference, leaving speculation that the iPhone 5S may not feature. However, this leak, suggesting otherwise, has reignited those rumours and we could very possibly see the iPhone 5S announced at WWDC 2013, and released for pre-order on July 20th.